Fiat has revived the Tipo name for its new family hatchback. The new car has been officially launched at the Geneva Motor Show and will go on sale in September with prices expected to start from £15,000. 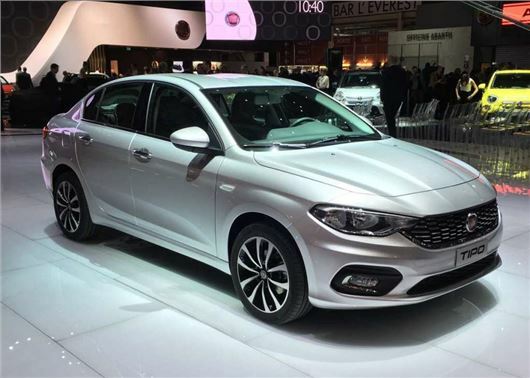 Available in estate or hatchback bodystyles, the Fiat Tipo will focus on value and practicality, with space for five large adults and high levels on standard equipment. Estate versions will carry loads of up to 1.8 meters in length, with 60/40 split rear seats and a completely flat load floor. Boot space will be 550 litres for the estate, while hatchback versions will offer 100 less with a maximum load of 440 litres. Fiat claims that the Tipo will provides exceptional roominess and be capable of accommodating three six-feet-plus adult passengers in the rear. There are three trim levels to choose from and all models get air conditioning, electric mirrors, DAB digital radio and Bluetooth connectivity, with steering wheel remote controls as standard. The engine range will comprise of five engines in total, with two diesels – a 1.3-litre MultiJet II producing 95PS and a 1.6-litre MultiJet II with 120PS - while the petrol range features a 1.4-litre unit with 95PS and a 1.4 turbo petrol with 120PS. There will also be a 1.6-litre e-TorQ engine producing 110PS, linked exclusively to a six-speed, torque converter automatic transmission. Fiat hasn't released fuel economy figures for all of the engines, but it has confirmed that the 120PS 1.6-litre diesel will return a claimed 76.3mpg and sub-100g/km of CO2.